The futuristic sounding City of Industry, just outside Los Angeles, is moving into the future with a solar carport and electric vehicle charging station project, the largest of its kind in southern California. Southern California's movie industry has helped shape our vision of the future, and one city is making that vision a reality. It is using a large municipal carport to provide the infrastructure to support solar power panels and provide shade for vehicles, as well as plug-ins to charge electric vehicles. The futuristic sounding City of Industry has just completed the Metrolink Public Transportation Station 2 megawatt (MW) solar PV carport and electric vehicle (EV) charging station project. The city is located east of Los Angeles following Interstate Highway 60. Dedicated primarily to industrial development, such as warehousing and manufacturing, City of Industry has a mayor but very few residences. The city is also home to the Metrolink Public Transportation Station, which allows commuters from surrounding communities to park their vehicles and board trains bound for downtown Los Angeles and the San Bernardino/Riverside area. The solar power and electric vehicle plug-in carport project has resulted in the installation of 8,372 stationary solar panels that are situated to provide much needed shade for vehicles using 940 of the carport's stalls. It is the largest project of its kind in Southern California and is generating revenue for the city through the sale of renewable power. Among the parking stalls are 64 charging stations for electric vehicles. A portion of the 2 MWs per hour of power generated by the solar panels (and sold by City of Industry under a 20-year power purchase agreement to Southern California Edison) is channeled back to the charging stations through the power grid. A strong motivator for Southern California Edison to participate in the project was a requirement by the California Public Utilities Commission for it to achieve 30 percent power production from renewable energy. As a result of that requirement, the power company put out an Independent Power Producer (IPP) Request for Offers, looking for potential sellers of renewable power to the utility. 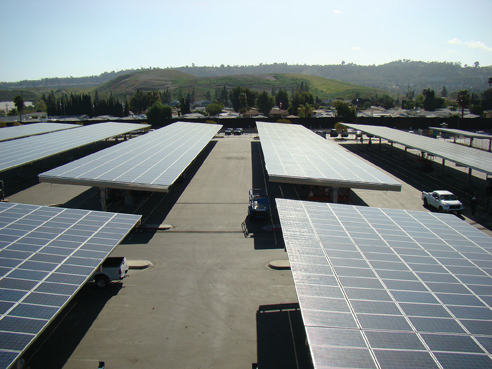 The City of Industry was among the successful applicants with its carport solar power project. One of the knocks against today's electric-powered vehicles is the short distance they can travel before they require recharging—usually in the range of 100 to 200 miles. The Metrolink Public Transportation Station charging stalls will provide electric vehicle commuters the opportunity to recharge their vehicles while they are in Los Angeles. Because the station is within a mile from two major freeways, individuals typically use the carport and train station to commute to jobs in Los Angeles. City of Industry Mayor Dave Perez says that electric vehicle owners will be able to swipe a credit card to pay for the power their vehicles consume while they are using the recharging stations. However, at this early stage, the city is not charging for the use of the recharging stations. The power generated by the solar panels will provide significantly more than just the power needed for the recharging stations. According to Southern California Edison, the 2 MWs per hour provide enough power for 1300 homes for one hour. To pay for the $11 million cost of the project, City of Industry tapped into funds collected under the state's Proposition A initiative. Proposition A funds derive from a half cent sales tax that Los Angeles County collects to generate money for transportation projects. 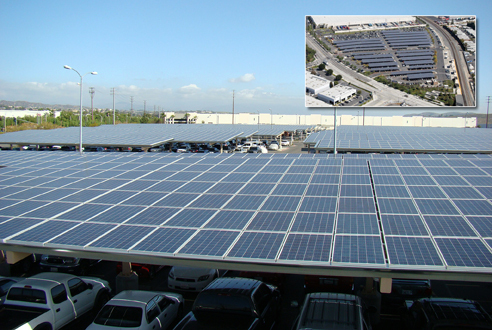 The City of Industry solar carport project took eight months to complete and was done in two phases to minimize the inconvenience to commuters using the adjacent train transportation link. Contractor Oltmans Construction closed half the parking lot for each phase of the project, meaning that only half the vehicles were displaced at a time. Upendra Joshi, project manager with City of Industry, says the city is very pleased with the project and the income it is providing. In fact, it is launching a second solar power generation project on the site involving a five-story parking structure that is being built near the Metrolink carport. A bus service provider called Foothill Transit is building the carport, and Joshi says the city has an agreement with them to use the structure's roof to install solar panels and generate power for the city. Ground breaking has just occurred on that project. Whittier, California-based, OltmansConstruction was the main contractor on the City of Industry Metrolink carport project. Company vice-president Tony Perez (no relation to the City of Industry mayor) says the solar power and vehicle recharging station project is a reflection of the future in several ways. First, more people in California are using electric vehicles. Second, there are a growing number of businesses that are establishing vehicle recharging stations in retail locations, near office buildings, and along major commuter highways in Southern California. And third, companies like OltmansConstruction have recognized the growing number of opportunities to bid on renewable energy projects like the City of Industry project, which specifically use existing carports and rooftops as infrastructure for the installation of solar power generation. It has become a big part of their business plan. "We've done quite a lot of rooftop solar work here in the Southern California market on warehouses," says Perez. "We started that division in 2009 and have completed about $100 million worth of work in two years." He adds that it continues to be an expanding market. The City of Industry project was their first involving a carport, although some of their sub-contractor team members have experience installing solar panels on military base carports. The two main sub-contractorsOltmans worked with on this project were Panelized Solar Inc. for installation of the solar energy modules and Gregg Electric Inc., the main electrical contractor. "Gregg Electric and Oltmans have done 38 megawatts of rooftop solar over the past two years, so we know what requirements we have to meet to get the job done," says Perez. While he has noticed a considerable improvement in air quality in the Los Angeles area during his years growing up there, he says there is no doubt that greater use of electric vehicles will help improve air quality even more. Prior to the installation, the Metrolink infrastructure consisted of a paved parking lot with 1200 stalls and the train station. Perez says that having a paved site to start with was an overall benefit in building the carport. Oltmans constructed the carport on the parking lot, consisting of a foundation and columns that support the solar panels. 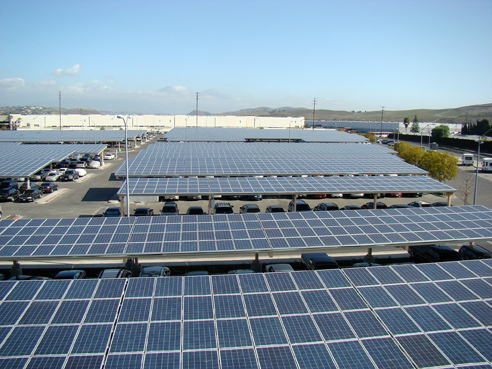 The fixed solar panel modules for the 1200-stall City of Industry carport were provided by Hanwha SolarOne. The combiner boxes for the solar panel modules were provided by SunLink. The structure does not provide shade to all of the stalls because of constraints like trees. The fixed solar panel modules were provided by Hanwha SolarOne. The combiner boxes for the solar panel modules were provided by SunLink. To wire all the solar panels and connect them to the power grid, Oltmans used 10 miles of conduit and 44 miles of wire. The company was able to connect the carport solar power generation network to an existing transformer on site. Power could not be channeled from the panels directly to the vehicle charging stations because the power produced by the solar panels is DC current while the outlet power is AC current. The power must be converted prior to use. The City of Industry project took eight months to complete and was done in two phases to minimize the inconvenience to commuters using the train transportation link. The parking lot was full every day during the week, and the contractor didn't want to displace more than 1000 vehicles to complete the project. So they closed half the parking lot for each phase of the project, meaning that only half the vehicles were displaced at a time. Construction was completed this past spring. Perez says that the size of the project and the fact that it is a municipally-owned facility is rather unique. "There are quite a number of carports in Southern California where solar panels are being placed on top of the structure," says Perez, "but they are not as big as this one, and there are definitely very few that are for a city. There is a lot of solar work being done at university parking garages." The use of carports to generate solar power is definitely trending up, Perez says—Oltmans has bid on a number of similar projects in the past six months. Using carports in this way is also one way to offset the cost of the carport. "In the southwest because of the sun, especially in places like Arizona, people put carports up," he says. "So rather than putting a carport up that is not generating any power, a lot of people are looking at putting up a carport with solar power generating capabilities because it will help offset some of the cost of the installation. You are generating revenue off the power that is generated from the solar panels." To further support the trend toward greater use of electric vehicles in Southern California, the City of Industry received an additional $2 million grant from the South Coast Air Quality District to purchase 28 electric powered vehicles—through a Nissan dealership—that will be offered to regular Metrolink users on a lease basis through a lottery system. The city will pick a day when its staff will randomly hand out applications to users of the carport.